Normally focused on Sports and Entertainment clients, SMC was asked to use its social and digital prowess to create an innovative campaign to leverage an historic and massive live event celebrating Pope Francis’ visit to the United States in the Fall of 2015. The target was Millennials and the goal was to help the Roman Catholic Church meaningfully connect with young people who were largely “unchurched” but also viewed as the future of Catholicism. Social listening, social and digital media were fundamental to the initiative, enabling SMC to keep a pulse on what young people were saying and sharing about the experience. Millennials are the largest generation alive and also most prone to have abandoned any official religious affiliation. At the same time, they also represented the future of the Church. The target audience would not be church going Americans but rather people who had never been members or drifted away from the Church. The conversation and subsequent listening, started when Pope Francis took off from Rome, traveled to Cuba and ultimately landed for his historic visit to the US. 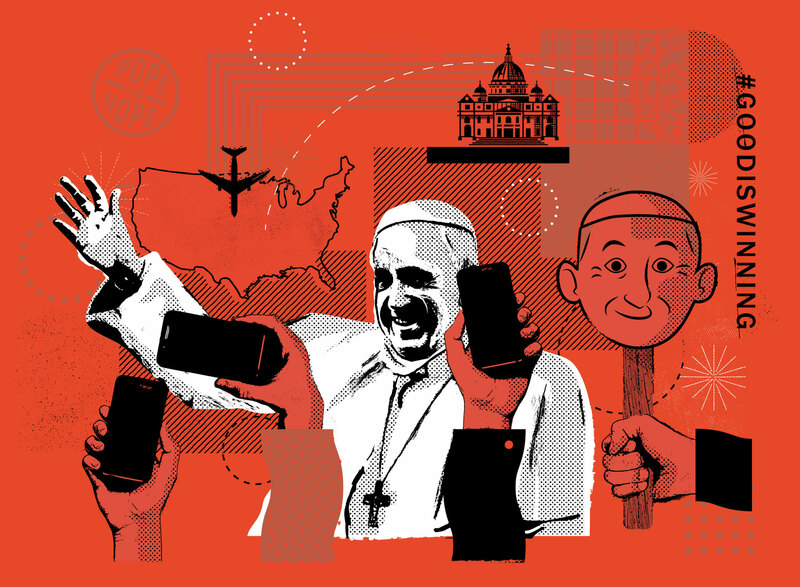 Though masses would naturally be drawn to the charismatic, humble and inclusive Pope, SMC needed to guide digital conversations and uncover insights and knowledge from more than 4 million daily posts. Beyond building positive buzz, the intent was to help the Church understand and extend the conversation with young people long after Pope Francis departed. Following Pope Francis’ directive for the Catholic Church to expand use of digital and social media for greater relevancy and accessibility around the world, Aletiea.org a global Catholic media company sponsored a monumental initiative to connect Millennials with the Church in conjunction with the Pope’s historic visit to the US. The largest generation alive was also most prone to have abandoned any official religious affiliation and yet also represented the future of the Church. To engage young people, and through social listening, SMC identified and activated a “Pope Is Hope” digital street team to produce a unique social and digital campaign called #GoodIsWinning and follow Pope Francis throughout his journey. The intent was to capture the imaginations of young people looking for inspiration and committed to creating a better world. SMC activated a social media listening Center in Philadelphia that operated 24/7 for ten days. The official #GoodIsWinning Social Media Command Center monitored and analyzed over 4million posts per day with impressions reaching multi-millions. SMC also produced and distributed a collection of original video, memes, GIFS and the heralded customized “popemoji” keyboard. Between mid September 2015 and April 2016, more than 1.3million Popemoji were shared on every continent. During the first week of its launch, downloads of the custom Popemoji keyboard was only outpaced by Disney’s Minions emoji set with 64k keyboard downloads the first week. An engagement rate of 9 to 1 was sustained six months later. To date, Popemoji earned 30.3 million impressions. While the campaign was conceived to capture the imagination of the young, it extended far beyond. The engaged public included staunch Catholics and even atheists. With exposure swelling well beyond religious outlets, the campaign crossed into pop culture on late night and morning shows, in People and Time and Elite Daily. One viral Vine, “The Pope as Rocky” racked up more than 1.3 million views. By engaging in conversations where people communicate, capturing Pope Francis’ personality, the stickiness and viral effect of the campaign was off the charts. The campaign’s sponsor, Aleteia.org documented posts like, “I’m not Catholic and I love this Pope.” “I haven’t been to church in years but I may just change my mind.” By enabling new conversations in a fun and different way, Aleteia intends to keep that community engaged over the long term. As a result, they’ve since commissioned additional Popemoji sets with Christmas, Mexican, Easter, World Youth Day and Peace themes. In Spring 2016 SMC released Popemoji in 7 languages.